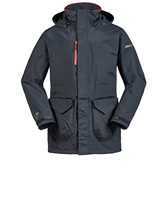 This long length jacket lined with Arctec 160 fleece is ideal for entry-level day sailing and outdoor pursuits. The Corsica BR1 Long Jacket is waterproof and breathable so you stay dry and comfortable in driving rain when active and the underarm and sleeve articulation gives you added freedom of movement. Keep out the rain, spray and wind with the adjustable cuffs, hem and hood. Behind the ocean style patch pockets, there is the luxury of fleece lined handwarmer pockets to keep your hands warm. The internal pocket also has a headphone exit point so you can enjoy the outdoors with your music in the Corsica.